–within a week of their respective openings. Since then, we’ve stayed at Art of Animation six more times for a total of eight stays–six more visits to the family suites, and one more to the Little Mermaid rooms. These two room types share all resort services. Otherwise they are profoundly different, and families reserving one while expecting the other are in for a shock! 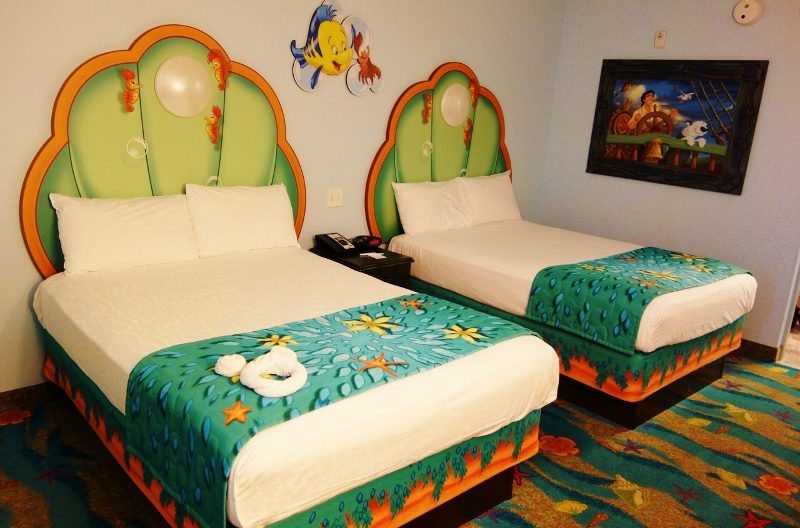 Little Mermaid standard rooms are the best place to stay for families seeking a standard value resort room. The Family Suites at Disney’s Art of Animation Resort beat out the alternative value resort Family Suites at All-Star Music on most dimensions as the best suites for first-timers. Because of the importance of this resort and these rooms–being new, and coming in at the top of their respective rankings–you’ll find thousands of words and hundreds of pictures in the later pages of this review. This page, by way of introduction, looks at the “big picture” of Art of Animation. You can have a wonderful visit at any Walt Disney World resort hotel. Compared to other Walt Disney World owned and operated resorts, the value resorts are distinguished by having the lowest prices, least amenities, and smallest standard rooms. In contrast, value resort Family Suites–predominant at Art of Animation–are quite large, and for some families may even be substitutes for a deluxe resort. 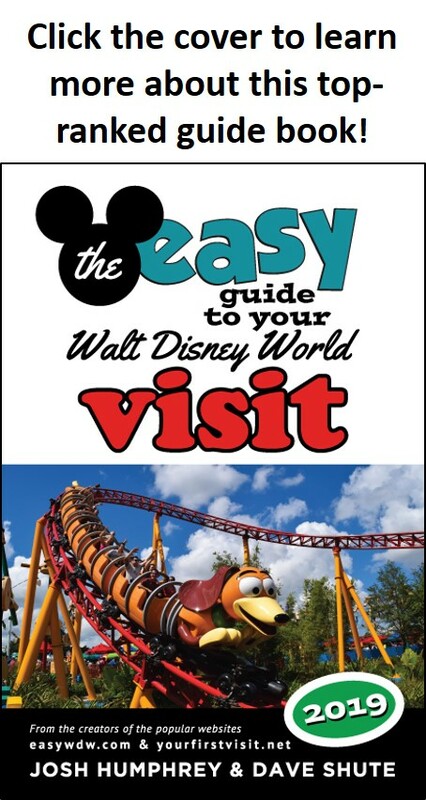 Note that the long-time travel agent partner of this site, Kelly B., can help you book your Disney World vacation at Art of Animation or anywhere else–contact her at at KellyB@DestinationsInFlorida.com or 980-429-4499. You likely will never stay in a hotel with smaller rooms than the standard rooms you’ll find at Disney’s value resorts. 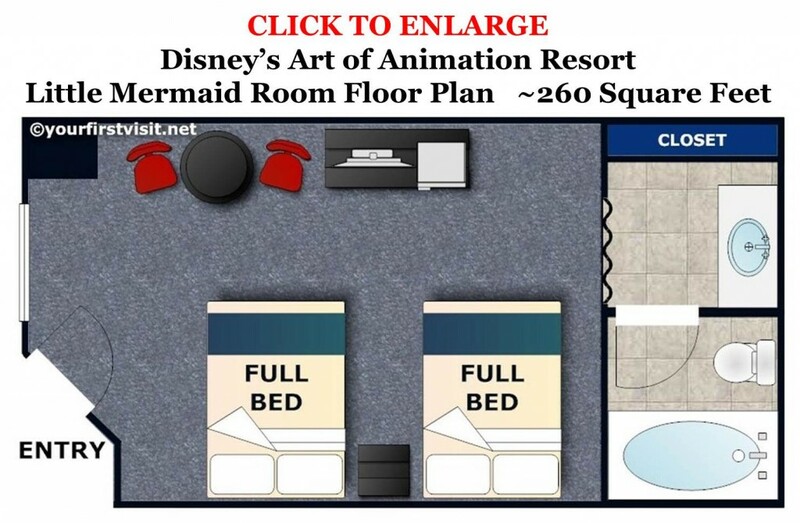 See the floor plan of a standard Little Mermaid room at Art of Animation. I could not imagine staying in one of these rooms if I had to add a crib as well (the room sleeps four in two full-size beds, plus one more, younger than three, in a crib). 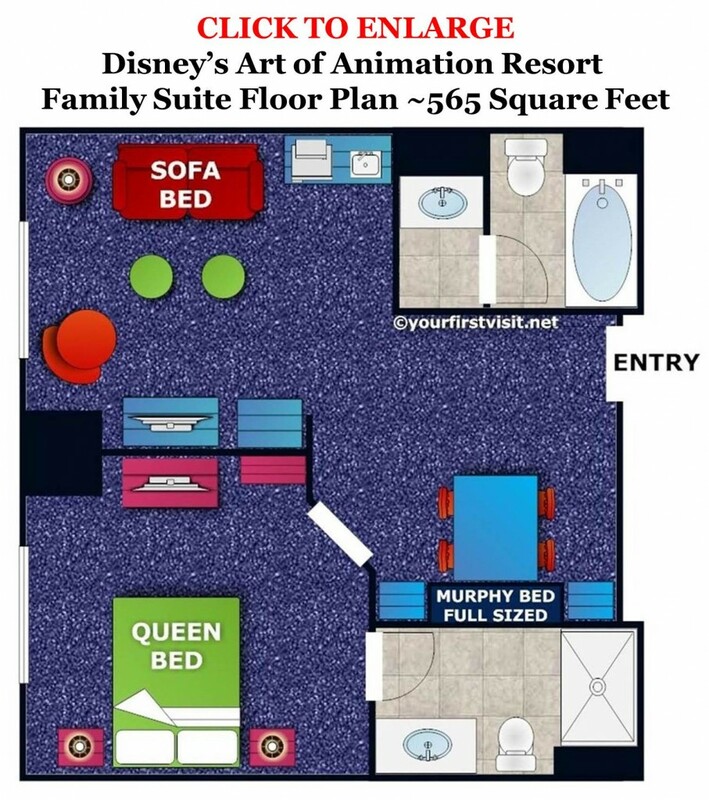 However, if your family will fit, standard rooms in Disney’s Art of Animation Resort have much more kid appeal than the moderate resorts, the next higher price class. 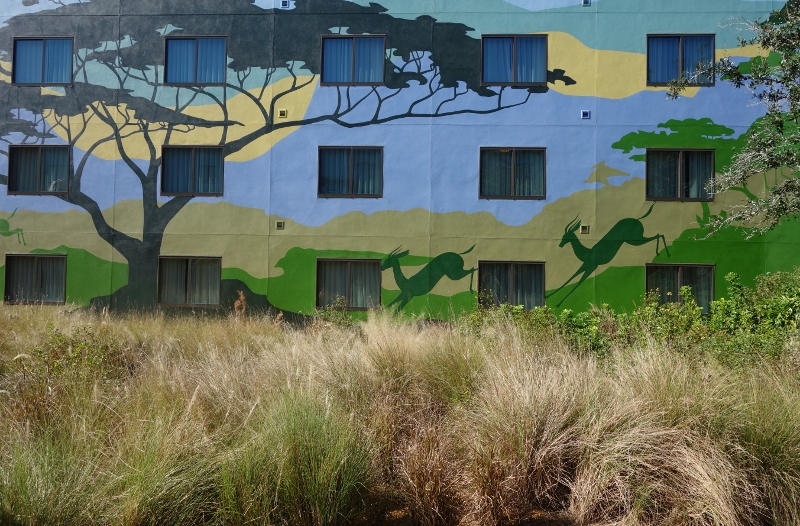 Compared to staying off-site, the value resorts are distinguished by their higher kid appeal, convenience, and access to certain key perks that off-site hotels can’t provide. Art of Animation has ten buildings, deeply themed in groups of two or three buildings around a well-loved Disney movie. 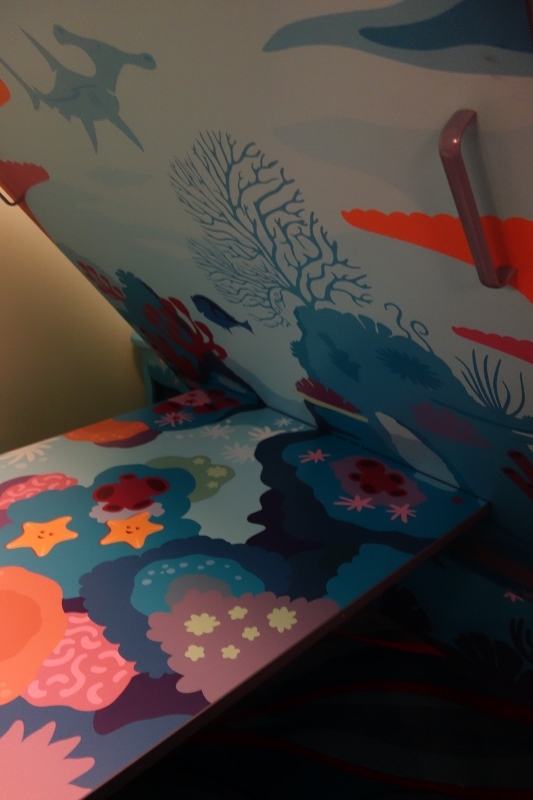 Standard rooms at Art of Animation all have a Little Mermaid theme. There are no Standard rooms in the Cars, Nemo, or Lion King areas, and no family suites in the Little Mermaid area. Contrary to some pre-opening concerns, these rooms are not too girly for little boys. Ariel herself shows up only once in the Little Mermaid outdoor area, and just once inside the room–on the shower curtain! In fact, Prince Eric is as present in the theming as Ariel is. Little boys will like these rooms just fine! The main problem with the Little Mermaid standard rooms at Art of Animation is their relative distance from the central resort services–the bus stop, food court, check-in desks, and main pool. Art of Animation was built on a site planned for an expansion of Pop Century. As part of that expansion the foundations, the central service building, and two of the ten hotel buildings were built a decade ago. The two already-built buildings, along with a third planned for the same themed area, were converted into the standard room area of Art of Animation. The other seven buildings–to become Family Suites–are on the same footprint, but profoundly different. By chance, the two already-built buildings also happened to be part of the grouping that is furthest away from the main central services. See the resort map above. 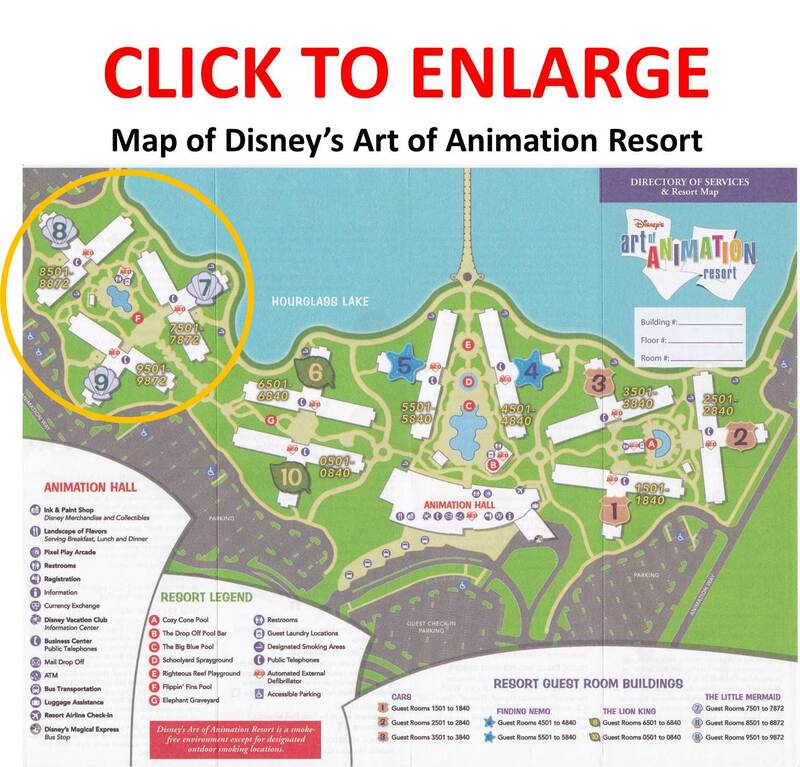 The Little Mermaid Rooms are in the orange circle on the left. None of these buildings is either wildly distant nor particularly convenient, and families with mobility issues should consider a preferred room at Pop Century. Among the Little Mermaid buildings, Building 7 is the best choice (one of the two closer buildings, and the only one of these two with rooms with a lake view), and building 8 the worst (the farthest). 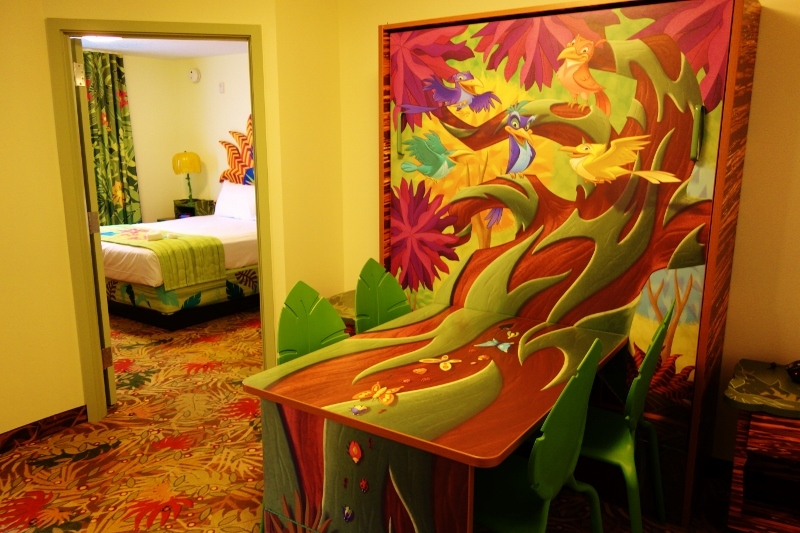 The Family Suites at Art of Animation combine innovative and flexible floor plans with deep theming based on the Disney movies Cars, the Lion King, and Finding Nemo that makes them uniquely attractive for larger families. These rooms sleep six in a space more than twice as big as the 4-person standard Little Mermaid rooms. There are three sleeping spots–two in the queen in the master bedroom, two on a fold-out couch in the living space, and two on a Murphy bed that folds down where the dining table shows on the floor plan. 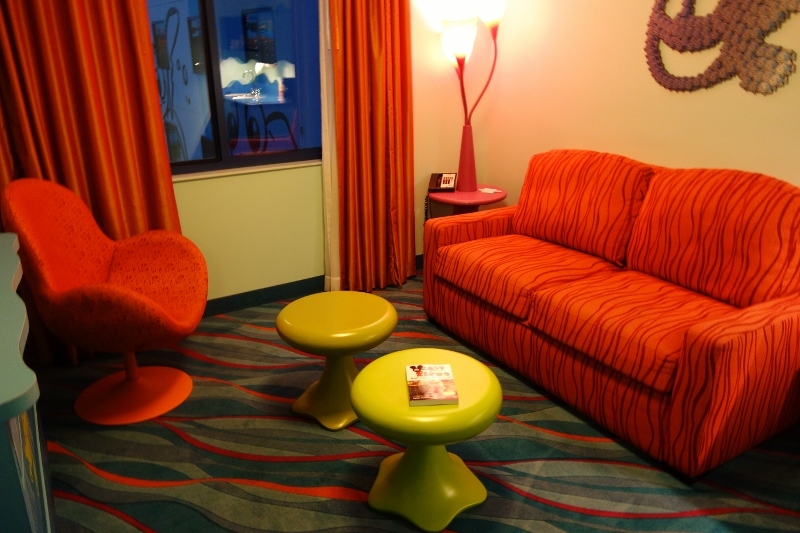 The number of beds (3 vs 4) and the dining table are the main furnishings differences between Art of Animation Family Suites and those at All-Star Music. Folding the bed down to make the dining table disappear is also just fun. These rooms are also much more deeply themed than those at Music–to an extent that may be garish to some families! All-Star Music Family Suites also have some other positives–a bigger living room and kitchen, four sleeping spots rather than three, and a lower price. For more details on the difference between these two types of suites, see this. But for most families, Art of Animation Family Suites will be the better choice. They have much more kid appeal, and more convenience, than those at Music. For those open to any of the three, a 2nd floor or higher Hourglass Lake view room on the Finding Nemo side of Building 6 in the Lion King area will be the best choice. You’d pick the Lion King buildings because these are the only ones at Art of Animation that don’t surround a pool. This makes them quieter. Second floor or higher to limit corridor noise, which in the Family Suite buildings can be a problem on the first floor. Hourglass Lake view, and thus Building 6, because this is the best view (Art of Animation and Pop Century are the only value resorts on a lake; why not take advantage of that view?). And the Finding Nemo side of Building 6 as that will put you closer to the central services of the resort. 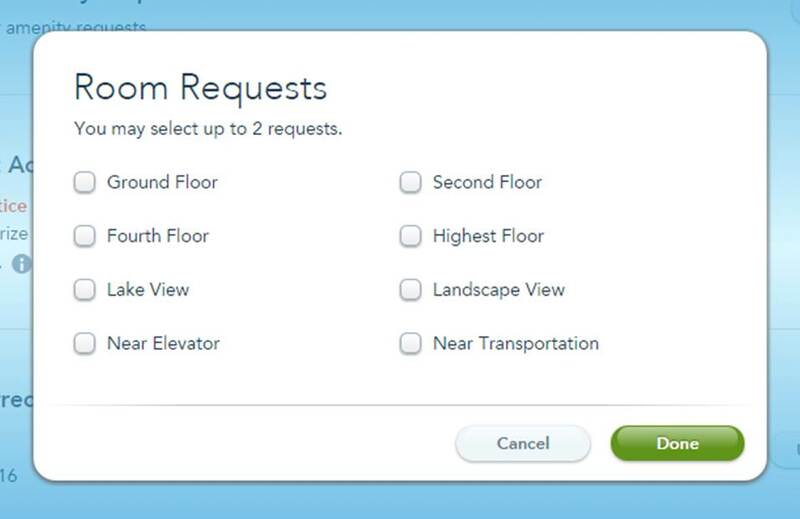 The room request form is the same for all Art of Animation areas. Note that, with one exception, when you book your room you get to pick which themed area you will be in–the exception is if you book a family suite on a deal. For more specific requests, put in a room request. WHY IS ART OF ANIMATION RANKED SO HIGH? Resorts are ranked on this site for first time family visitors based first on their kid appeal, and then on their convenience. Art of Animation has the most kid appeal of all the values, and as much convenience as any. 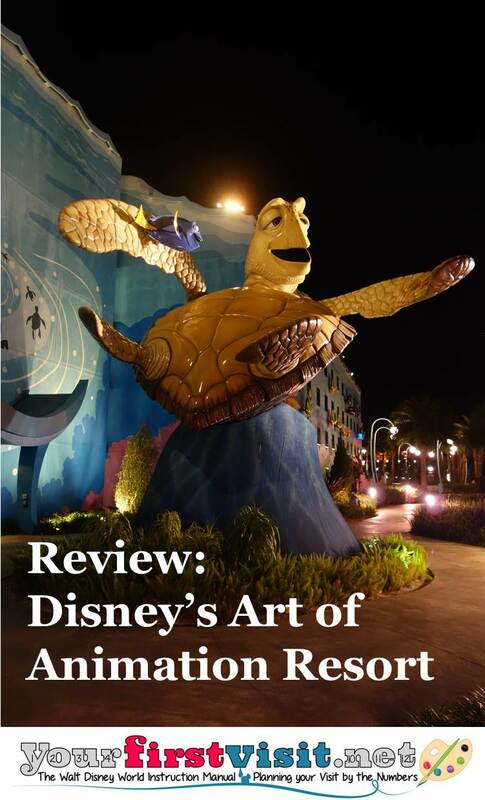 This makes Art of Animation my highest-ranked value resort at Walt Disney World. Several of the deluxe resorts–notably, the Wilderness Lodge, Animal Kingdom Lodge, and Polynesian Resort–have spectacular kid appeal. None of the moderates do. 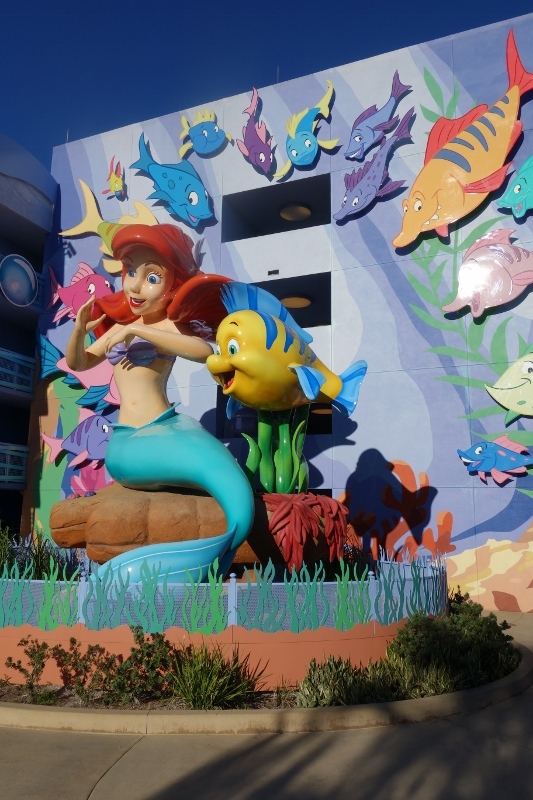 All of the value resorts–Disney’s Art of Animation resort, Disney’s All-Star Sports, All-Star Music, and All-Star Movies, and its Pop Century resort–have terrific kid appeal. 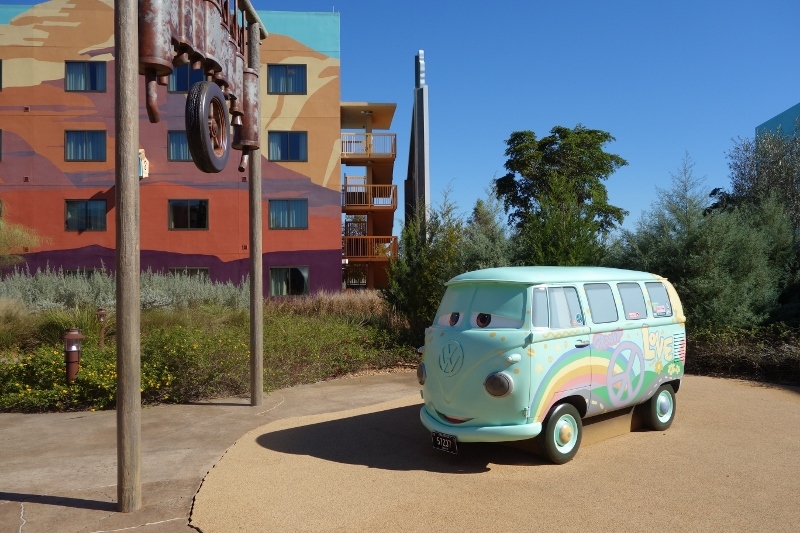 This appeal comes from the approach to theming they all share: bright and vibrant exteriors, framing much larger than life objects of interest to kids. These objects reinforce that these resorts were designed for the sake of kids…and not necessarily for adults! Art of Animation takes this theming to a new level of immersiveness. Its four areas each have two or three buildings themed around a movie with great kid appeal–Cars, Little Mermaid, the Lion King, and Finding Nemo. The rooms are more deeply themed to their respective movies than the rooms in any other value resort are themed to their topics. 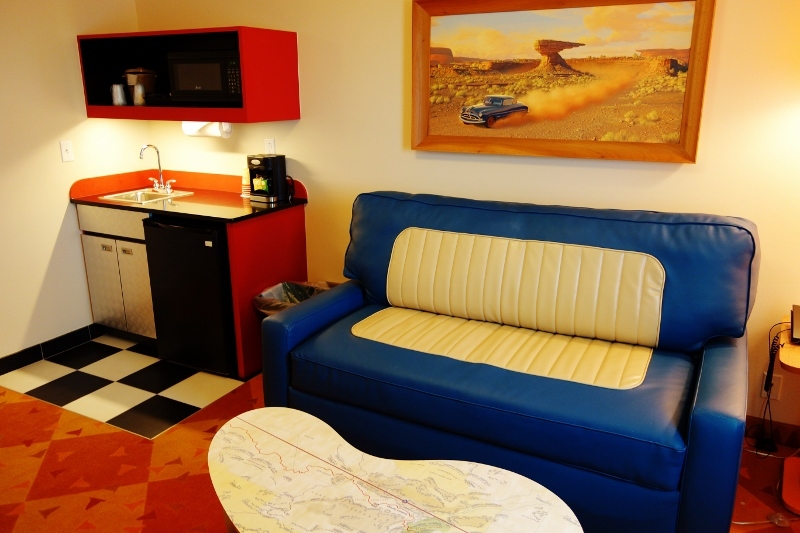 See the view of the Cars Family Suite above, for example, and the detail of its theme. Even more astonishing is the theming outside the rooms. The environments around the Art of Animation buildings are deeply themed to recall the settings of these movies. This is particularly effective in the Cars (above) and Lion King (below) areas, and least so in the Little Mermaid section. 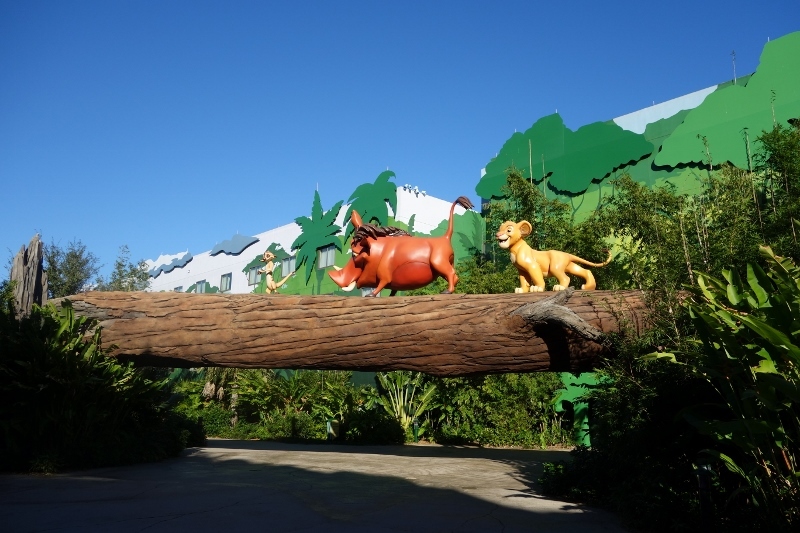 The Cars and Lion King areas are in fact so deeply themed to their settings that the areas around them may be a little off-putting to those who are not fans of these films. Disney’s Art of Animation Resort is slightly more convenient than the All-Stars, and mostly as convenient as Pop Century. Compared to the All-Stars, it is more central. Although Disney officially classifies it, like the All-Stars, as an “ESPN Wide World of Sports” Area Resort,” it is in fact quite centrally located. It is just south of Disney’s Caribbean Beach Resort, nestled in the area between Epcot and Disney’s Hollywood Studios. It is closer to Epcot, Disney’s Hollywood Studios, and the Magic Kingdom than the All-Stars are. Each of the All-Star resorts has only one bus stop, but they often share their buses with one or both of the other All-Stars. Pop Century is a little easier to get around for than Art of Animation is for those in standard rooms. The standard rooms at Art of Animation are more distant from the hotel’s central services than 70% of Pop’s are. 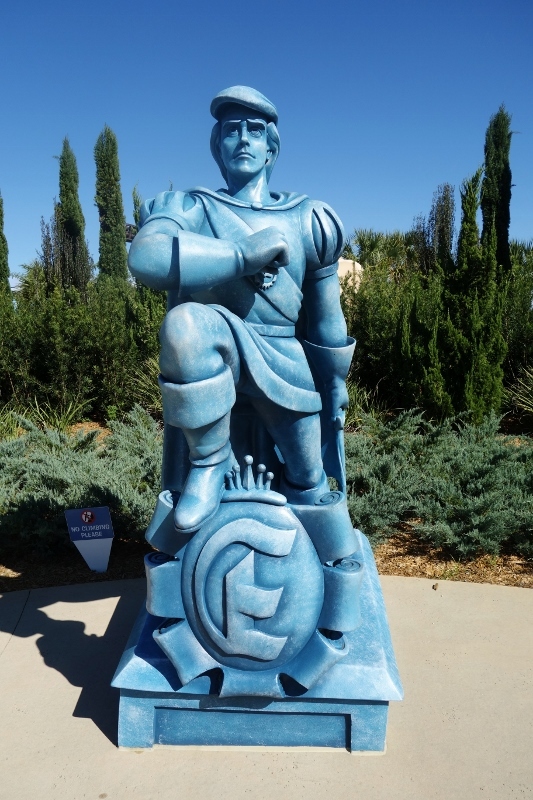 Compared to the other value resorts, Art of Animations’ strengths are its unmatched kid appeal from its great theming, transportation convenience at the highest level of the values, its vast number of really well-designed Family Suites, and the best food court on any Disney World resort hotel property. The only weaknesses it has compared to other values is that its 4 person standard rooms (all in its Little Mermaid section) are less convenient to the hotel’s central service area than most of those at any other value. Note also that all of its standard rooms have full beds and no coffeemaker. Refurbed Pop Century rooms have queen beds and coffeemakers. The long-time travel agent partner of this site, Kelly B., can help you book your Disney World vacation at Art of Animation or anywhere else–contact her using the form you can find here. Thanks Dave! I don’t know how I missed this page. If you change it just delete this post as it won’t make sense anymore. Thanks John, fixed! My (very mild) dyslexia sometimes shows up in surprising ways! My family are still deciding on which AoA Family Suite to stay at; I noticed that you say Lion King and Nemo Section are the best, and you give the best room request possible, but I seem to notice that you have not added a Cars Section. May I ask what will be the best there? Sylvie, at Cars vous voulez an upper-story lake-view room near transportation in Building 3! Without your recommendation and seeing the WDW Resort “infomercial” we DVR’d, I never would have chosen this resort based on the resort pics available on the WDW website. The still pictures just don’t do it justice! I was initially thinking that we’d go the Moderate route, but after reading many reviews, including yours, the savings of going with a Value just made sense/cents. In order to divert our vacation budget funds toward other things (like our Trader Sam’s tab), we decided to give AoA a shot. 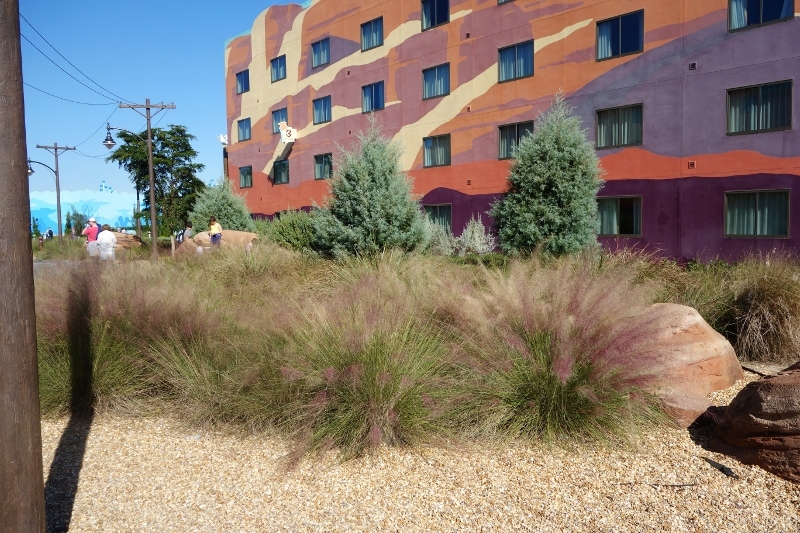 Upon arrival, we were really struck by the lovely trompe l’oeil landscaping on the grounds, particularly in the Little Mermaid and Nemo areas. The Big Blue Pool and exterior theming in all the areas are just incredible. Over the top, but in an immersive, thoughtful way. 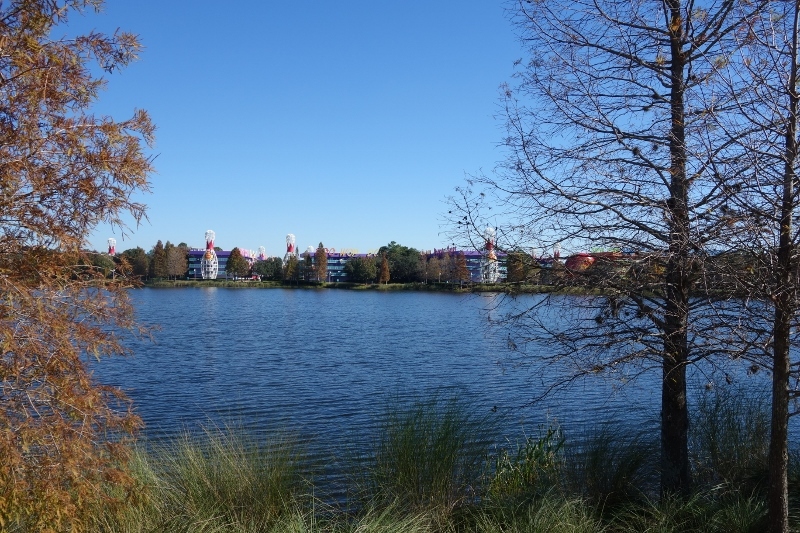 We ended up in a LM room, building 7, 3rd floor, with a nice view of Hourglass Lake and the 50s area of Pop Century. The room itself was cute in decor (I especially loved the underwater scene inside the shower), but very basic, which we were fine with! We had generally very positive experiences with bussing to and from the parks, only having a 15+ minute wait to board following park close at Epcot. Most instances, we waited 10 minutes or fewer to board from arrival at the bus queues. Getting to and from Landscape of Flavors to refill mugs and get snacks was longer than desired, so we carried one or two mugs with us on the side of our park bag and filled them up at night on our way back to our room for enjoying the next morning. Iced coffee still has caffeine in it, right!? I did not find AoA to be overrun with kids, obnoxiously loud, or unkempt. In fact, I think our experience dispelled many of my preconceived notions of the “Value” WDW resorts. Hello! How long is the walk to the big blue pool from a Lion King room? Thanks! Hi Heather! from the furthest room it’s 250 yards. I’m so glad I found this page!! It is awesome! I’m planning my trip in May 2018, do you know when I can schedule my trip? I understand that hotels have some kind of preference access to the Theme Parks, but I didn’t find which is the Theme park of D. Art Animation Resort, do you know? Internet showed me a map with some colors (Red, Purple, Green, blue) but DAAR isnt on it. Jesus, it’s a different park each day. The calendar for what’s available will be out in a few months–likely November. Can you please tell me how long the bus ride is from the Art of Animation area to the Magic Kingdom, Animal Kingdom and Hollywood Studios? Hi Patricia, it’s around 15-20 minutes to MK and AK, and 10-15 minutes to HS.